Works on record linkages and data analysis. Agrima is a Computer Engineer and consultant at HRDAG. She works on record linkages and data analysis for the Colombia project. She recently completed a project at the Lawrence Berkeley Lab working on high-bandwidth memory on the newest Intel chip. 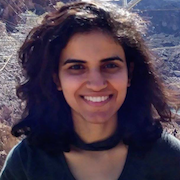 Agrima has an undergraduate degree in Computer Science from Delhi University (2013), and received her Masters in Operations Research from University of California, Berkeley in 2016. Between those, she worked as a Software Engineer at Deutsche Bank.